Windows 98 it so old that most attacks don't work, and most malware won't run. That poses the question, are the 9x versions of Windows susceptible to modern Malware? I have my own thoughts on this question, but I thought I'd query the community first. The very first step of an attack is to probe the target for platform. Pentesting applications such as metasploit have much more numerous and varied techniques to breach Windows 98 as opposed to the newer Windows versions. By extension, most malware in the wild will also check for platform. In fact, much of that malware has its origins in Metasploit, especially those malware deployed by script kiddies. Yes and no, mostly no. Yes in the sense Windows 9x is vulnerable to most of the exploits patched by the various Windows XP (and above) service packs and security updates. The manufacturer has ended support for those OS versions and has no intention of providing any additional updates. No in the sense that any executables targeting a version of Windows higher than Windows 9x will (or uses some then unavailable WIN32 API) will refuse to run on your system. 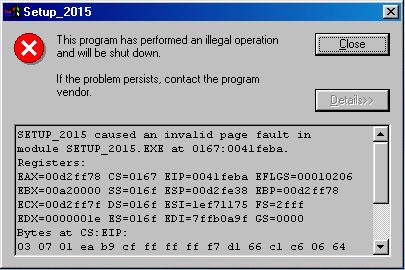 See this example alert when trying to run a Skype executable designed for Windows XP and above. Pre-XP versions of Windows are certainly vulnerable to targeted attacks, such as you'd see from Metasploit -- if you're the sort of high-value target that attracts such attacks, don't run Windows 98.
and one I haven't been able to trigger to get a screenshot of, where a system library is missing an expected function. The last is probably your greatest protection, in fact: most programmers will, deliberately or accidentally, target Unicode-based systems. If you haven't installed the optional unicow32.dll library on your Win9x system, Unicode-based programs can't run. @Mark is on the right track with this when discussing targeted versus non-targeted attacks. To be more specific, this depends on the nature of the threat that you are trying to defend against. If you are up against a hostile government, organized crime syndicate, or similar threat that is specifically targeting you and is actively engaged in gathering intelligence on your operations and infrastructure, running older operating systems isn't going to provide a meaningful defense as the hackers will just target you with exploits for whatever OS you use. If you are defending against random opportunistic attackers who are looking for quick and easy victims, older operating systems will likely provide some defense as most opportunists are going to be targeting the most commonly used operating systems. Not the answer you're looking for? Browse other questions tagged windows-95 windows-98 malware or ask your own question.